Mist lays low on an ancient Hawaiian valley, two armies have come face to face, ready for battle. Slingers began the battle, propelling heavy volcanic rocks at nearly musket ball speeds. Slings are a woven range weapon preferred over the bow by Hawaiian warriors. An ambitious king, protected by a brilliant feather armor cloak, orders the crescent shaped formation of his warriors forward. The armies collide with a terrifying roar and deadly arms take their toll. Spears, sharks tooth clubs, stone hammers, trip cords, swordfish daggers and dozens of other weapons reveal the dark side of paradise. 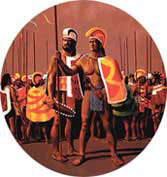 In ancient Hawaii warfare is a favorite game for kings and nobles. In fact the Hawaiian word for 'battlefield' is 'playground'. The wars of tribal polynesian antiquity, climaxed bloodily soon after Captain Cooks visit but their history lives on. As the brilliant colors of sunset fade, fires can be seen across the islands. Hawaiian drums beat rhythms that reflect the thoughts of the Kahunas, the priests of Hawaii. The heat of the day dissipates as a village comes alive. The warriors have returned to their village victorious, their bodies stained with blood. Tonight a captive enemy will be sacrificed to Ku, the god of war. The victim, taken alive but with every bone in his body systematically broken for easy of transport from the battlefield welcomes this relief. An ancestral wild energy flows from the village, terrifying tiki masks and tattooed (Hawaiian Tattoos ) men dance in the fire light before the temples alter. In the mythic time before the arrival of Capt. Cook a kapu (taboo) system held society together. With astronomers, seers, Mu (temple sacrifice seekers) and kahunas (priests) the many religious needs of the tribes were filled. Gods like Pele, the fire goddess and the shark god with his dragon watchers must be appeased. Ancestors deliver mana, the ancestral prestigious rights to position in the feudal chaste system. Kapus dictate everything from eating to making love and braking these taboos could be punished by death. The legends told of hero's and cannibalistic dogmen. The idols watched all of these scenes, with the flickering firelight revealing their scowling faces under the bright stars. Keep informed about MythicHawaii.com headlines with our new RSS feed. Links to the latest articles about the islands mythic past. Copyright 2011 MythicHawaii.com. All rights reserved.